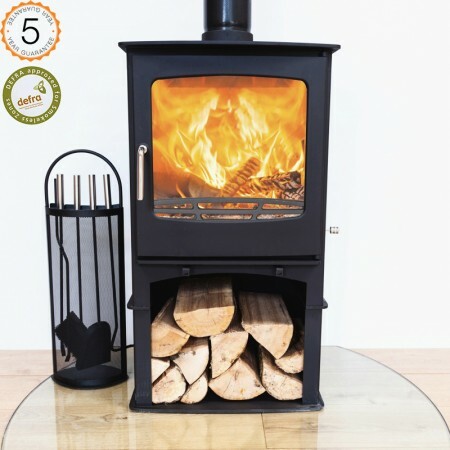 This advanced Purefire stove is designed by Ecosy in Hampshire and tested to CE, BS and Defra standards here in the UK. This stove has had thousands invested into its development and benefits from the latest seconday/tertiary burn technology that prodcuces a clean efficient burn and mesmorising dancing flames. 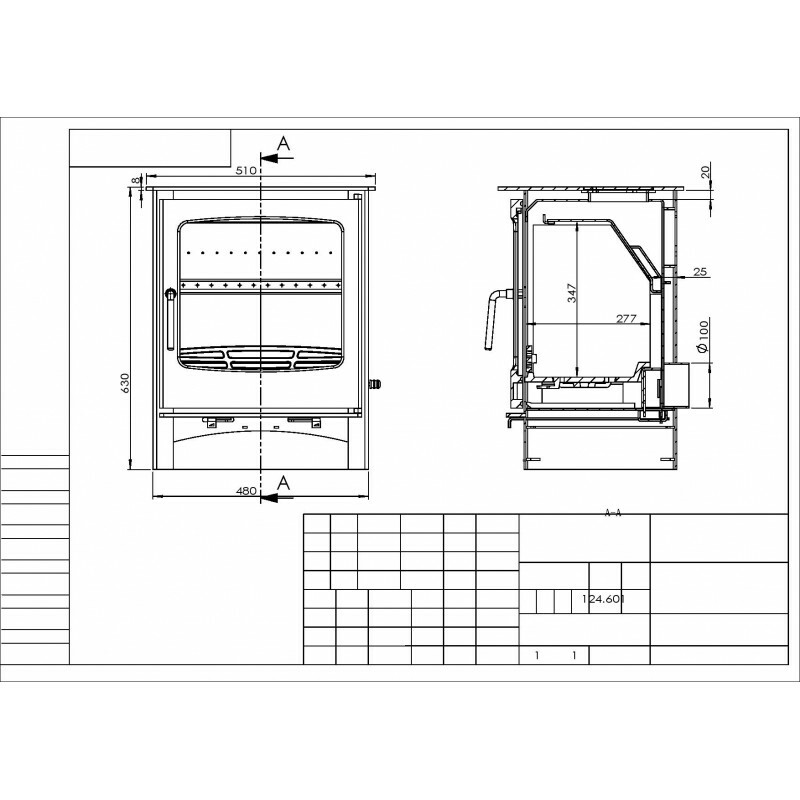 This advanced stove also benefits from having an integrated air jacket that has cold air from the outside fed into it, drawn over the fire box and dispersed over the glass. This design is thought to be the most effective way of keeping the glass clean and clear of smoke stains. Click here to find out more. (Direct air feed kit not sold or provided. 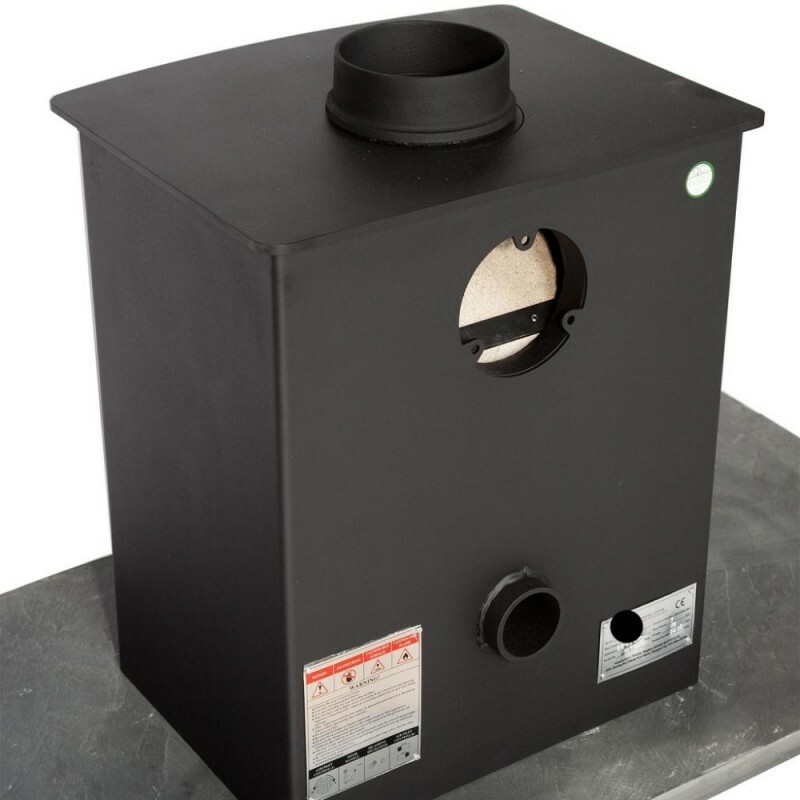 Direct air outlet has a 60mm internal diameter and 66mm external diameter pipe at the rear of the stove. The stoves minimalistic looks have been made possible by discreetly tucking the air controls under the fire, leaving the smooth clean lines of the door to shine. The controls are still easy to reach and move. Stand: - This unit comes with a thick steel removable stand that fixes securely to the base of the fire. 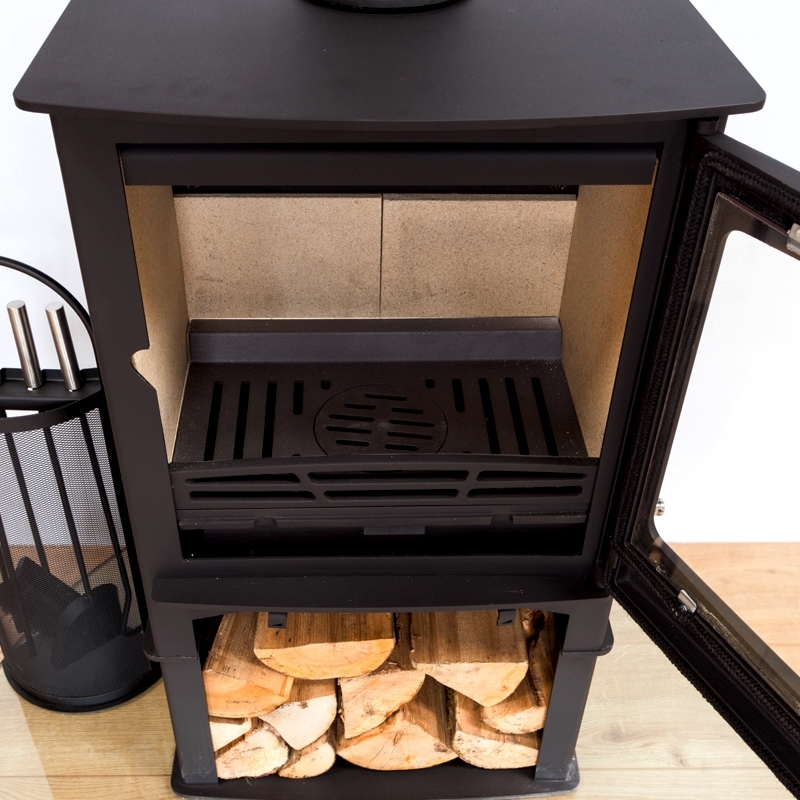 The stand is perfect for making the stove a more prominant feature when being installed in a large inglenook fireplace or freestanding in a room. 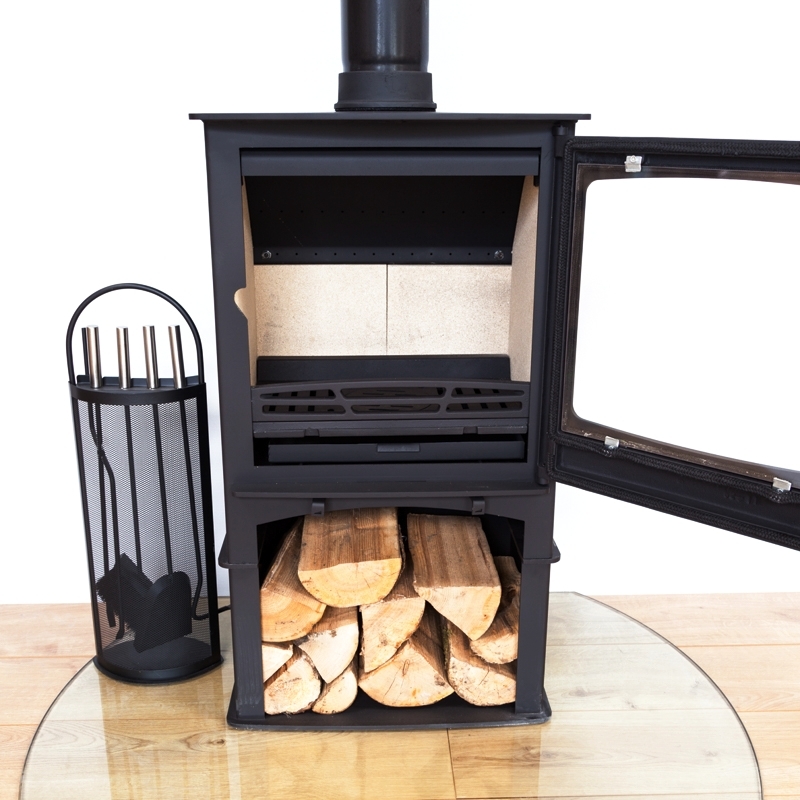 Storing logs below the fire is not only practical but complimentary to the overall look of the stove. The Purefire has been rigorously tested and approved to burn wood in a smoke controlled zone. 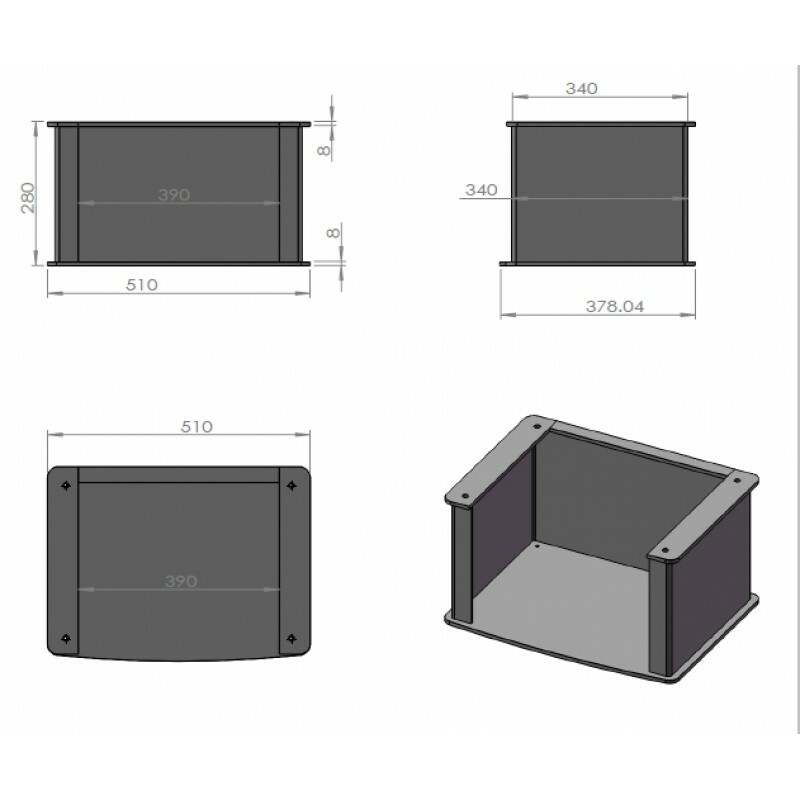 This has been achieved by fitting mechanical stops to prevent full closure on the primary and secondary air control. With these changes a 5" flue liner can also be fitted onto this stove. The Ecosy+ has an advanced secondary/tertiary clean burn system. On more advanced units like this one, it is common to have the air fed in from the rear (see picture 3) and split off to be fed under the fire, over the fire (Secondary burn) and over the glass to help keep it clean and clear (Airwash system). The secondary burn feature is a real advantage as this re-burns the initial gasses and smoke produced from the fire. This means you are getting every drop of heat from your fuel and in turn will save you filling the stove up as often, saving you money and time on fuel. Height : 910mm, 35.82 inches. Please note that this is the price for delivery of Defra Approved Ecosy+ Purefire 10kw Curve Woodburning Stove With Stand 5 YEAR GUARANTEE only. The final amount might change depending on the contents of your shopping bag when you check out.